Self Storage in San Francisco, CA at 1400 Folsom St. Extra Space Storage is a convenient storage solution for San Francisco residents in and around South of Market, Hayes Valley, and Mission District. 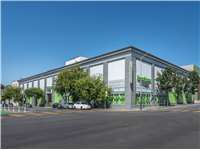 Our facility is just off Folsom St. between 10th St. and 11th St. and is easily accessible from Hwy. 101 and I-80. Locals will recognize our location next to Mercedes Benz of San Francisco and across the street from Sextant Coffee Roasters. We're also accessible for those living in nearby apartments and condos, including Folsom Dore Apartments, Glasdore Lofts, L Seven Apartments, OLUME, NEMA, Lantern Lofts Apartments, and more. The space is easy to access; good location; very clean. The staff that I've interacted with have all been helpful, friendly and knowledgeable about the space. Overall, the place is clean and adequately prepared for your storage needs. The staff is friendly and accommodating as much as they can be. The location is good because it's near downtown, but not too near. They're very special, helpful, and gave me great deal! Wonderful costumer service, clean and safe environment. In today's market, I feel costumer service is top priority, and they exceeded all my expectations. Highly recommend using this storage facility. Call first to see if they have what you want is available. If so, go and see what a A+ location it is. A personal customer viewing is done with a staff member that is able to answer any questions you may have. The best part is if you want to move your stuff there a FREE truck is available. WOW I'm pleased to have found this place, and you will too. This facility is so customer service oriented , freindly TEAM STAFF most especially Oliver & James ,, they sure made me feel welcome and go above and beyond ... They make their number one priority with their business... VIP treatment so do speak!!! Great Job I honestly will recommend this to my Friends & Family!!! Bonnie, #C2036, Folsom St, S.F. This facility is clean, reasonably priced, and easy to get to. However, the hours of access to storage is limited. The hours of operation need to be a bit longer. Say from 5am - 12pm than its current 8 am - 7 pm and 4pm in Sunday. It's just not enough time. The manager of this store is very friendly and accommodating. Recently, I showed up with some items I needed to place in storage, and I arrived 5m before the storage gate closed. Unfortunately, I realized I also had lost my keys. The manager was nice enough to sell me another lock, proceed to grind the lock off (which was no small feat) and then allowed me to move my items in without a single complaint. This required him to stay about 45m after closing time and I am very grateful for this man's patience and understanding. I highly recommend this location. I only wish they were open longer hours. I had a good move in experience when I arrived. The staff was friendly and accomodating. I like that the location is close to my house. I have absolutely no complaints what so ever. And I LOVE having the ability to pay online! There's nothing I hate more than having to write a check out to someone. I've used extra space storage, on and off, for 8 years. I have needed storage at a moments notice and changed units during a lease. They have always been able to accommodate my needs. The staff are great to work with pleasant and knowledgeable. The facility is clean . They are very conveniently located and their prices are on par with the market. There is usually a move in special, a truck for large moves and bonuses for referrals. Being the night owl I am, the only negative thing I could say about this facility is that I wish it had 24 hour access. That said, however, I probably couldn't give this facility the excellent security rating I feel it deserves if renters were allowed to come and go at all hours. ...or living there. Getting the first month free is a great incentive to get started out when you find yourself suddenly in need of a storage unit! And Mark's customer service is great. I liked seeing the same familiar face nearly every time I was there. And when I couldn't figure out my log in to pay my bill online the first time, from halfway across the US&A, he was patient and helpful when assisting me on the telephone. We've always experienced great service whether we need a new unit, have questions, are making a payment, etc. It's been fast, thorough and courteous every time.